So what is CHIRON and why did I decide to choose that as a company name? Chiron was the name of a Centaur, a figure from Greek mythology that was half man half beast. But Chiron was different from the unruly and party-goers of his brethren. He was the wisest and most just of the centaurs, nurturing with skills in medicine, music, archery, hunting and prophecy. He was said to be the discoverer of botany and pharmacy as well as the science of medicine and herbs. 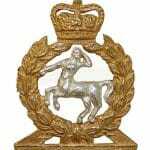 The British Army’s Royal Army Veterinary Corps (RAVC) depicts Chiron as its Regimental cap badge. 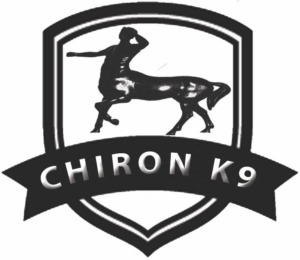 I served for 22 years in the RAVC as a Dog Trainer and wore the emblem of Chiron in my headdress for the whole time. With operational deployments as well as assisting training teams around the world I was grateful for the time and experience the RAVC gave me. It also taught me the basics of dog training, but more importantly, allowed me to expand outside the box and work on Research & Development projects which pushed my skills to the limit. 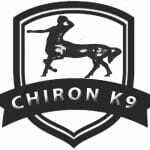 So when it came to choosing a name for my new venture, I chose CHIRON! Having completed 6 months basic training I went to the Army Dog Training School in Melton Mowbray, Leicestershire, UK to be trained as a dog trainer. I had to complete a 2 week basic dog handlers course, 6 week basic equitation course, 6 week veterinary technician course and 12 week basic dog trainer course. This armed me with the basic requirements to be a dog trainer in the Royal Army Veterinary Corps. Moved to the USA for a 1 year contract to establish an off-leash detection dog project for the Department of Defense. I was based at Fort Leonardwood, Missouri. In January 2006 I relocated to Texas to be Senior Technical Advisor of the Specialized Search Dog off-leash detection course at 341st Training Squadron, Lackland Airforce Base. Relocated to North Carolina to establish a Combat Tracker Dog course for the US Army. Accepted position as the Project Manager for the United States Marine Corps Improvised Detection Dog Handlers Course. During 7 years with the company I was promoted to program Manager for research & Development to include responsibility for the IDD 2.0 project researching advanced off-leash detection dog techniques. I was then promoted to Director of the Canine Training Center.